The juice craze has been upon us for a while but while most people think of fruits when they order juice there's a growing number of people choosing to opt for vegetarian based juices instead. In this infographic, the team from who make the Omega J8006 Juicer set out figures that suggest an 8% increases in the past two years for sales of vegetable based juices. 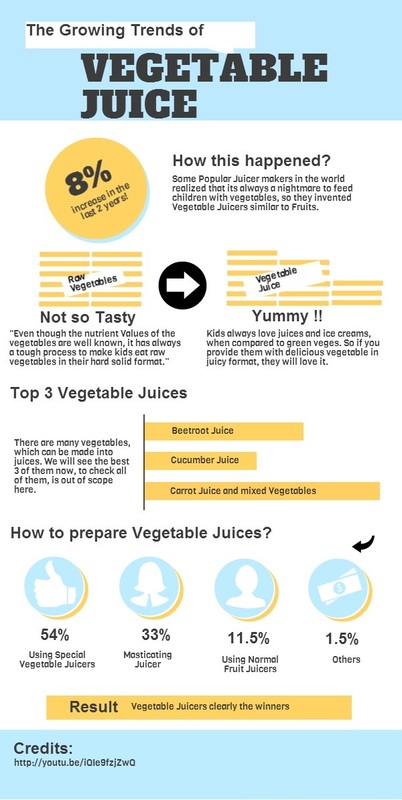 The infographic suggests that beetroot, carrot and cucumber juice are among the most favored vegetables for juicing. It's not the first time the growing popularity of vegetable juices has been highlighted at the end of 2012 the juice maker Tropicana announced a range of vegetable based drinks to please sugar conscious consumers and in April 2013 a study by the market researcher Packaged Facts on Fruit and Vegetable Juices: U.S. Market Trends showed that while sales of traditional juices such as orange were decreasing, more exotic mixes including the ones made with vegetables were steadily increasing.